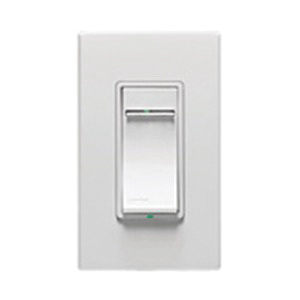 Leviton Vizia +® 1-Pole 3-Way Multi-location fluorescent dimmer has voltage rating of 277-Volt at AC 60-Hz. Dimmer in white/ivory/light almond color, has digital circuitry that provides soft on and fade off. It is suitable for use with Decora® and Decora Plus™ screwless wallplates. It has maximum load capacity of 1200 VA. Wall mountable dimmer measures 1.75-Inch x 1.4-Inch x 4.13-Inch. Dimmer operates at temperature range of 0 to 55 deg C. Fluorescent dimmer is UL listed and CSA certified.